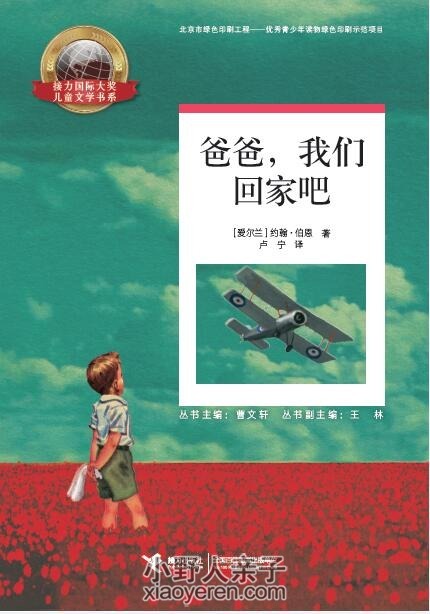 读一本好书，约翰•伯恩，《等一等，再离开》_活动召集_小野人活动_小野人亲子活动网 - 最受欢迎的亲子网 亲子策划 亲子活动!! John Boyne is an Irish author of novels for adults and young readers, including the award-winning The Boy in the Striped Pyjamas (2005) set in Germany during World War Two.His fourth children’s novel, Stay Where you are and then leave, also shortlisted for the Irish book awards Children’s book of the Year (2013), opens in London on the 28th of July, 1914, as the First World War is breaking out. It is also Alfie Summerfield’s fifth birthday and all he wants in the world is to ride the milk float with his father Georgie and deliver the milk. Georgie promises not to enlist in the army, but arrives home the next day wearing a soldier’s uniform having signed up. At first Alfie and his mother, Margie, receive cheerful letters from Georgie from the training camp and then from France, but the letters become increasingly darker and confused, and Margie refuses to read them to Alfie and hides them. Later Alfie find them and reads them for himself, and then after Georgie has been away for over two years, the letters stop altogether. Margie tells Alfie that this is because Georgie is on a secret mission and cannot write to them anymore. Alfie is not convinced and thinks that his father must be dead, but after a chance discovery that his father is in a hospital in England, he sets out on his own mission to bring his father home. While some of the events in the novel seem contrived, such as Alfie’s meeting with the Prime Minister and the plot device whereby he find out where his father is, Boyne’s novel is remarkable for his treatment of narrative point of view. The novel uses a third person narrator, but events are described almost entirely from Alfie’s point of view. As with Boyne’s earlier novel, The Boy in the Striped Pyjamas, this technique shows how large-scale events impact on the life of an ordinary young person and also how a young person’s understanding of events can be limited and confused. Those limitations, in turn, can be empowering for readers who are able to know what the character knows, but are also able to fill in gaps in that understanding through their own knowledge of the world and history. Further, those readers with little knowledge of the events of World War One will be inspired by the gaps in Alfie’s narration to find out more about that history: why, for example, are Alfie’s neighbours, the Janāček family, taken away by soldiers as ‘persons of interest’? The technique also allows Boyne to create a believable young character who, by virtue of his ignorance and naivety, is also empowered to rescue his father, but to also help support his mother financially. In this way, Boyne’s narrative techniques treat both his readers and his characters with an intellectual respect: readers are not lectured or talked down to, but rather expected to have the intellectual resources to put the story together; and his characters are intelligent and resourceful, able to take positive actions in a chaotic and confusing world. Boyne’s writing is also remarkable for its detailed focus on the everyday lives of working class Londoners and the sensitivity with which characters are rendered. With Georgie away in France, Alfie’s mother has three jobs: she works as a nurse at the hospital, and she does laundry and mends clothes for wealthy London women. The extreme life of poverty in which she and Alfie are living in is alluded to through details such as: her constant worrying about how the bills are to be paid, her tiredness and unusual shortness of temper with Alfie, and references to food shortages in contrast to the array of food Margie prepared for Alfie’s fifth birthday party on the eve of the war. Through characterisation, the author depicts a diverse cross-section of the London populace, showing how everyday people lives in London were changed during and after the war. Alfie’s neighbour and best friend, KalenaJanāček, who was born in London, lives with her father, Mr Janāček, a migrant Jew from the Eastern European city of Prague, who owns and runs the local corner-store and sweet shop. Before the war they are an accepted part of the community. Six months into the war, however, Mr Janāček’s shop windows are smashed, the store vandalised and graffiti, reading ‘No Spies Here’, painted on the door. Shortly after this, soldiers arrive and Kalena and her father are taken away to an Internment camp. Another neighbour, Joe Patience, is a Unionist, a supporter of the Women’s Suffrage movement (which campaigned for women to be able to vote) and a ‘conchie’, or conscientious objector – that is he refuses to enlist in the army and be made to kill others. Before the war his views are tolerated, but as the war ensues he is verbally abused and physically beaten, and after conscription is introduced he is imprisoned in Wormwood Scrubs, a London jail, for two years. One night in 1918 as his mother is counting the pennies in her purse and deciding whether she should pay the rent, the coal man or the grocer, Alfie, now nine, has an idea. Having seen young boys polishing men’s shoes at King Cross station, he decides that is it time for him to do his bit in contributing to the household finances. He breaks into Mr Janāček’s still empty house, ‘borrows’ his shoeshine box, and, unbeknown to his mother, begins a shoeshine business at the train station – slipping a few coins into his mother’s purse each evening, but not so many that she will notice. Alfie’s business venture further enables the introduction of more characters and more insight into varied wartime experiences, as each of Alfie’s customers have their stories to tell. Mr Podgett, a bank manager, is a regular customer who boasts to Alfie about his son, Billy, increasing the number of men that Billy commands with each mention. Towards the end of the conversation, however, his facial expression becomes sorrowful and his voice quieter, as he implicitly expresses regrets as to the kind of young man Billy has grown up to be – that is, a leader of a battalion who enjoys war and wants it to never end – and finishes saying of his son that ‘there was a kindness there once’. Alfie also meets Wilf, a young returned serviceman who works at the War Office having lost a leg at the Battle of Mons. Wilf has been given a day off to attend the funeral of his younger brother, killed in France, and he talks with anger and hatred about what it is like to be out of uniform, and the hostile reactions he receives from people who don’t notice his cane. Encounters such as these are poignant; they paint the horror of war, the hypocrisy, hatred and misery that it generates, and way in which the war impacts on so many different aspects of everyday peoples’ lives. A central theme of the novel is with the family; while the war threatens to tear Alfie’s family apart, love and family connectedness have a healing capacity. Faced with poverty, starvation and the threat of eviction, Margie and Alfie both willingly make sacrifices. When Alfie eventually finds out where his father is, he travels to the hospital, not knowing that it is a military hospital for injured and maimed soldiers. Again, what Alfie sees here is described in detail, as is Alfie’s horrified emotional response; the visceral images of maimed and clearly distressed soldiers do not spare readers’ emotions, and, instead, paint vividly the horror and trauma that these men have experienced, and, the trauma that nine-year-old Alfie also experiences. I am reluctant to disclose how the narrative resolves, suffice to say that Boyne’s novel, on summation, is a moving, poignant but ultimately uplifting account of how individuals survived the trauma, brutality and futility of what was called The Great War, and ‘the war to end all wars’ – it is a bitter irony that there has subsequently been many more wars and that Boyne’s research has generated a beautifully written and moving novel. GMT+8, 2019-4-24 20:57 , Processed in 0.032833 second(s), 12 queries , Apc On.